Mitt Romney, the GOP’s presumptive presidential nominee, won’t give out the names of his bundlers, the super-fundraisers who individually rake in anywhere from tens of thousands to millions of dollars for the campaign from an array of donors. But from election records, you can learn that among Romney’s biggest rainmakers is a cadre of lobbyists representing some of the biggest industries in America. As Public Campaign’s Adam Smith notes, two of Romney’s bundlers—Wayne Berman of Ogilvy Government Relations and Tom Fiorentino of the Fiorentino Group—have reached the campaign’s “Stars” level ($250,000 minimum) and one, Barclay’s Durkin, has reached the “Stripes” level (minimum $500,000). That’s Romney campaign lingo (PDF) for the two most elite levels for fundraisers, each of which give the fundraiser inside access to the campaign with weekly briefings, invitations to exclusive Romney finance committee retreats, and VIP access at this summer’s GOP convention. 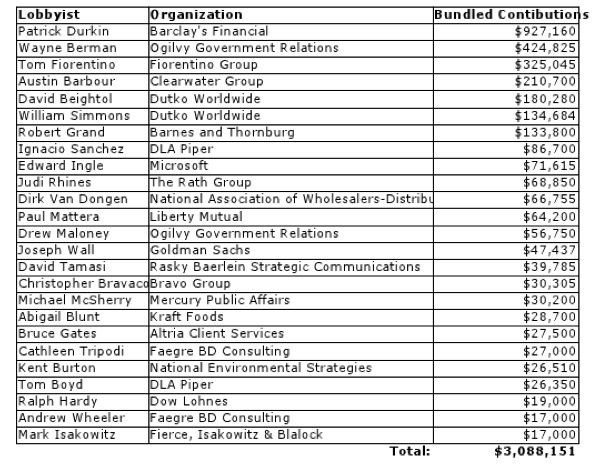 Of course, we don’t know all of Romney’s bundlers because, unlike the Obama campaign, Romney’s team won’t disclose them. None of Obama’s bundlers is registered as a lobbyist, though, as the New York Times reported last year, at least 15 of them engage in lobbying without officially registering.